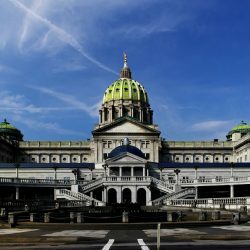 HARRISBURG – Senator David G. Argall’s (R-Schuylkill/Berks) latest monthly television report, The Argall Report, highlights a special “behind the scenes” tour of the Pennsylvania State Capitol. The Capitol is a one-of-a-kind structure, finished in 1906, containing 640 rooms, priceless murals and stained glass, marble, 24 karat gold leafing, massive bronze chandeliers, carpets, draperies and ornate woodwork. It is widely-recognized as one of the most beautiful state capitol buildings in the nation. The Argall Report takes you on a tour of the Capitol Building, including the House and Senate Chambers, along with the Pennsylvania Supreme Court. It also contains stunning video of the inside and outside of the Capitol Dome—modeled after St. Peter’s Basilica in Rome, Italy. · Berks Community Television (Comcast – Channel 15, Comcast Southern Berks – Channel 965, and Service Electric – Channel 19) on Thursday at 8 p.m., Friday at 6 p.m., Saturday at 11 a.m.